Peppermint Patty and Marcie’s relationship in Peanuts. In The Peanuts Movie, Charlie Brown finally makes progress in winning the affections of his unattainable crush, the Little Red-Haired Girl. On one hand, it’s heart-warming and well-earned, but on the other, it feels philosophically out of place. The world of Peanuts has always been a bountiful, goofy garden of unrequited love, and not just for Charlie Brown: Lucy pines after the unreceptive Schroeder; Sally dotes on her uninterested “Sweet Babboo,” Linus, who at one point develops a schoolboy crush on his teacher, Miss Othmar. But all these relationships pale in comparison to the pairing with the greatest depth of feeling, the most intriguing mystery, and the snappiest lines: Peppermint Patty and Marcie, who are either both in love with Charlie Brown, or actually in love with each other, depending on whom you ask. 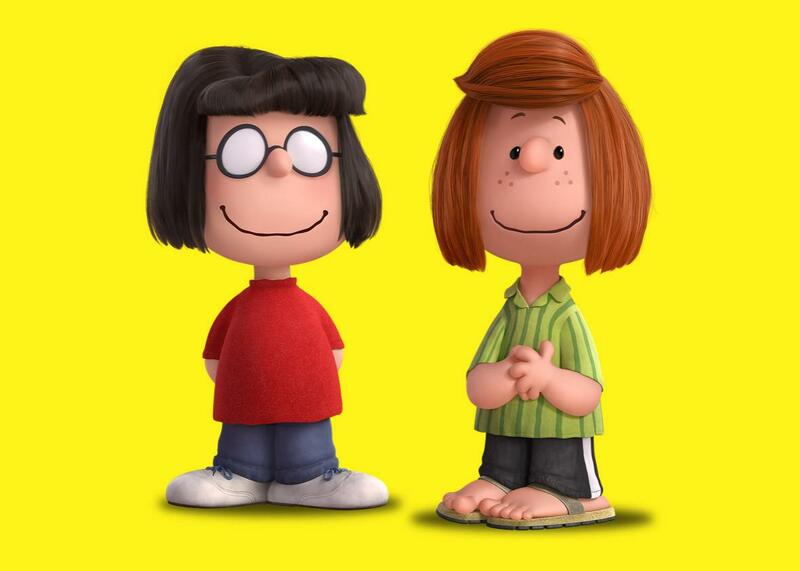 In Charles Schulz’ original comic strips, both Peppermint Patty and Marcie have unrequited crushes on Charlie Brown. Peppermint Patty usually tries to conceal her affection—although Marcie quickly figures it out, perhaps even before Peppermint Patty herself is willing to admit it. Later on, Marcie also develops a crush on Charlie Brown, whom she calls “Charles.” In the new film, Peppermint Patty’s flirtation is overt. Despite all this, some look at the girls’ reluctance to wear dresses and uniquely argumentative (yet close) bond, and see a glimmer of something more. What if Charlie Brown is nothing more than the perfect beard? Many fans and TV references have advanced this theory. Saturday Night Live questioned Marcie’s sexuality in 2000, and The Simpsons similarly called out Peppermint Patty. Family Guy depicted the two together as adults, and Robot Chicken had the two making out in its “Great Pumpkin” parody. There are also plenty of fan theories—and yes, some fanfics—with a similar message. Although it’s lovely to consider the possibility that Schulz made a veiled attempt at LGBT representation—it wouldn’t be Peanuts’ only political move—it’s not likely. Peanuts pivots on unrequited love, after all, and despite their somewhat fractious relationship, Peppermint Patty and Marcie are very close and typically honest with each other. Their relationship is two-way and conversational, whereas Peanuts crushes are typically one-directional, one character following the other, endlessly monologuing, while the other responds (if at all) with an eye-roll and a “good grief.” And although some of the strips in which Peppermint Patty and Marcie discuss their feelings about Charlie Brown can seem like they’re talking in code about one another, it should be noted that both girls also had crushes on boys who weren’t Charlie Brown. Patty became infatuated with Pig-Pen briefly circa Valentines Day 1980, and in Bon Voyage, Charlie Brown (And Don’t Come Back!! ), both girls developed crushes on a character named Pierre. Not long after, Peppermint Patty seems to develop feelings for Charlie Brown, and tries to get him to see her as a girl. But Charlie Brown, true to form, remains oblivious. “You’re in love with Chuck, aren’t you, sir?” Marcie asks. Peppermint Patty indignantly claims he’s too boring and “wishy-washy.” Charlie Brown overhears, and he and Peppermint Patty become so mortified they both lock themselves in their respective bedrooms, forcing Marcie to become their go-between as she remains convinced an increasingly defensive Peppermint Patty is, indeed, in love. When the two finally make amends, Peppermint Patty once again tries to drop subtle hints, and Charlie Brown foolishly relates by mentioning his crush on the Little Red-Haired Girl. We don’t see Marcie again until the next year, when she’s back at camp with Peppermint Patty, who feels insignificant next to the beauty of the Little Red-Haired Girl. Linus tells Peppermint Patty that “someday, someone is going to look at you and say, ‘Behold! A great beauty!’ ” And who enters the next frame? Marcie. Over the years to come, the girls get closer, and we see Marcie a bit more often. Years later in 1979, when Charlie Brown is in the hospital, Peppermint Patty and Marcie sit outside on a park bench and look up at his room. Peppermint Patty seems almost ready to grapple with her feelings aloud, but Marcie beats her to the punch: “I love Chuck! I think he’s real neat.” She’d apparently go to senior prom with him, or even marry him, if he asked. No matter what happens with Charlie Brown, the girls’ relationship stays constant. Their friendship is the closest female parallel to Charlie Brown’s and Linus’. Like Linus, Marcie is the unassuming one with sage-like insights—the perfect foil for Peppermint Patty, who can get as harried and anxious as Charlie Brown. They’re a match made in heaven, and exploring their romantic possibilities as a possible subversive element within the family-friendly franchise is endlessly entertaining. But surveying the long and fascinating history (and counterhistory) of Peppermint Patty and Marcie, I wonder why no one really poses the same romantic scenarios for Charlie Brown and Linus. Is Charlie Brown’s crush on the Little Red-Haired Girl somehow more legitimate than Peppermint Patty’s or Marcie’s on him? Or is it simply more common sport to poke fun at the butch girl and her dorky hanger-on?